Training is a set of a systematic processes designed to meet learning objectives related to trainees' current or future jobs. These processes can be grouped into the following phases; needs analysis, design, development, implementation, and evaluation. The phases are sequential, with the outputs of the previous phases providing the inputs to those that follow. Figure 1 depicts the phases and their relationships. Training delivery methods consist of the techniques and materials used by trainers to structure learning experiences. Different training delivery methods are better or worse at achieving various learning objectives. 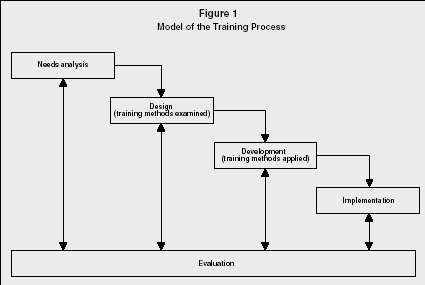 During the design phase (see Figure 1) the different methods are examined to determine their appropriateness for the learning objectives. Once appropriate methods have been identified, they are applied to the training plan in the development phase. There are three categories of learning objectives: knowledge, skills, and attitudes (KSAs). Knowledge objectives are of three types: declarative, procedural, and strategic. Declarative knowledge is the person's store of factual information. Procedural knowledge is the person's understanding about how and when to apply the facts. Strategic knowledge is used for planning, monitoring, and revising goal-directed activity. Skill reflects one's proficiency at specific tasks such as operating a piece of equipment, giving a presentation, or making a business decision. Attitudes are beliefs and/or opinions about objects and events and the positive or negative affect (feelings) associated with them. Attitudes affect motivation levels, which in turn influence a person's behavior. Most training programs have learning objectives for knowledge, skill, and attitudes; these programs need to combine several methods into an integrated whole because no single method can do everything well. The various training delivery methods can be divided into cognitive and behavioral approaches. Cognitive methods provide information orally or in written form, demonstrate relationships among concepts, or provide the rules for how to do something. They stimulate learning through their impact on cognitive processes and are associated most closely with changes in knowledge and attitudes. The lecture, discussion, e-learning and, to some extent, case studies are cognitive methods. Though these types of methods can influence skill development, it is not their strength. extent, case studies are behavioral methods. Both behavioral and cognitive methods can be used to change attitudes, though they do so through different means. On-the-job training is a combination of many methods and is effective at developing knowledge, skills, and attitudes, but is best at the latter two. The lecture is best used for creating a general understanding of a topic. Several variations in the lecture format allow it to be more or less formal and/or interactive. In the pure lecture, communication is one way—from trainer to trainees. It is an extensive oral presentation of material. A good lecture begins with an introduction that lays out the purpose, the order in which topics will be covered, and ground rules about interruptions (e.g., questions and clarification). This is followed by the main body of the lecture in which information is given. The topic areas should be logically sequenced so that the content of preceding topics prepares trainees for the following topics. The lecture should conclude with a summary of the main learning points and/or conclusions. During the pure lecture trainees listen, observe, and perhaps take notes. It can be useful in situations in which a large number of people must be given a limited amount of information in a relatively short period; however, it is not effective for learning large amounts of material in a short time period. Thus, an effective lecture should not contain too many learning points. Trainees will forget information in direct proportion to the amount of information provided. Because the pure lecture provides only information, its usefulness is limited; when the only training objective is to have trainees acquire specific factual information, better learning can be achieved at less cost by putting the information into text. This allows trainees to read the material at their leisure and as often as necessary to retain the material. The only added value provided by the lecture is credibility that may be attached to the lecturer or the focus and emphasis provided by trainer presentation skills. Another major benefit of the lecture is that it is interactive, and that trainees can ask questions or have the presenter change the pace of the lecture if necessary. The discussion method uses two-way communication between the lecturer and the trainees to increase learning opportunities. This method uses a short lecture (20 minutes or less) to provide trainees with basic information. This is followed by a discussion among the trainees and between the trainees and the trainer that supports, reinforces, and expands upon the information presented in the short lecture. Verbal and nonverbal feedback from trainees allows the trainer to determine if the desired learning has occurred. If not, the trainer may need to spend more time on this area and/or present the information again, but in a different manner. Questioning (by trainees or the trainer) and discussions enhance learning because they provide clarification and keep trainees focused on the material. Discussions allow the trainee to be actively engaged in the content of the lecture, which improves recall and use in the future. Trainee questions demonstrate the level of understanding about the content of the lecture. Trainer questions stimulate thinking about the key learning points. The pure lecture is most useful when trainees lack declarative knowledge or have attitudes that conflict with the training objectives. The discussion method is more effective than the pure lecture for learning procedural and strategic knowledge because of the discussion and questioning components. If the training objective is skill improvement, neither the lecture or discussion method is appropriate. Both the lecture and discussion method are useful for changing or developing attitudes, though the discussion method is more effective. The lecture, and especially the discussion, modify employee attitudes by providing new insights, facts, and understanding. Many companies have implemented e-learning, which encompasses several different types of technology assisted training, such as distance learning, computer-based training (CBT), or web-based training (WBT). Distance learning occurs when trainers and trainees are in remote locations; typically, technology is used to broadcast a trainer's lecture to many trainees in many separate locations. Distance learning provides many of the same advantages and disadvantages as the lecture method. Distance learning can be much less expensive than paying for trainees in multiple locations to travel for a lecture, but it may reduce motivation to learn because of the remoteness of the trainer. Computer-based training and web-based training are virtually similar. With this type of training, content is delivered through the computer, using any combination of text, video, audio, chat rooms, or interactive assessment. It can be as basic as reading text on a screen or as advanced as answering quiz questions based on a computerized video that the trainee has viewed. The difference between CBT and WBT is that, with CBT, the training program is stored on a hard-drive, a CD-ROM, or diskette. This means that it is not easy to update and may be more difficult for employees to access. Conversely, WBT is housed online through either a company's intranet or through the World Wide Web. This increases accessibility of training; employees may even be able to train from their home computers. Additionally, updates to content are quick and relatively easy. For example, if an error in the training content is found, one update on the training program housed on a server updates the content for every trainee who accesses it after that point. For a change to made to CBT, new CD-ROMs or diskettes would have to be produced. E-learning is effective at developing declarative and, in particular, procedural knowledge. It can be useful in developing some types of skills and for modifying attitudes. E-learning develops declarative knowledge through repeated presentation of facts, using a variety of formats and presentation styles. It can do an excellent job of describing when and how to apply knowledge to various situations. Procedural knowledge is developed by allowing trainees to practice applying the knowledge to various situations simulated by the software. This training delivery method is valuable because it can automatically document trainee's responses, interpret them, and provide appropriate practice modules to improve areas of weakness. Using e-learning, skill development is limited by the software's ability to mimic the trainee's job environment and context. For some situations, such as training employees in the use of word processing, spread sheet, and other computer-based software, e-learning is an appropriate choice for teaching skills. Here, the tasks and situations trainees will face on the job are easily simulated by the training software. On the other hand, it is very difficult to develop CBT software that realistically simulates interaction between two or more people or a person and an object in a dynamic environment. Other methods must be utilized for these situations. E-learning can be effective at developing or modifying attitudes. The factual relationships among objects and events, and the consequences of particular courses of action, can be portrayed in many ways with e-learning technology. How objects, events and their relationships are perceived can be altered by the visual and textual presented in a CBT. However, since the objects and events are simulated, rather than real, the emotional or affective side of attitudes may not be activated. In addition, there is no opportunity during e-learning to discuss attitudes with others in a setting where a trainer can monitor, direct, and reinforce the discussion to support the desired attitude(s). This may be one reason many adult learners indicate a preference for e-learning to be combined with some form of instructor-based training. Trainees often prefer blended training, which is when both computer and face-to-face training are combined, and it is used by many organizations. Simulations are designed to mimic the processes, events, and circumstances of the trainee's job. Equipment simulators, business games, in-basket exercises, case studies, role playing, and behavior modeling, are types of simulations. Equipment simulators are mechanical devices that incorporate the same procedures, movements and/or decision processes that trainees must use with equipment back on the job. Among those trained with this method are airline pilots, air traffic controllers, military personnel, drivers, maintenance workers, telephone operators, navigators, and engineers. To be effective the simulator and how it is used must replicate, as closely as possible, the physical and psychological (time pressures, conflicting demands, etc.) aspects of the job site. To facilitate this, the equipment operators and their supervisors should be involved in the simulation design and pre-testing. This reduces potential resistance to the training and, more importantly, increases the degree of fidelity between the simulation and the work setting. Business games attempt to reflect the way an industry, company, or functional area operates. They also reflect a set of relationships, rules, and principles derived from appropriate theory (e.g., economics, organizational behavior, etc.). Many business games represent the total organization, but some focus on the functional responsibilities of particular positions within an organization (e.g., marketing director, human resource manager). These are called functional simulations. Games that simulate entire companies or industries provide a far better understanding of the big picture. They allow trainees to see how their decisions and actions influence not only their immediate target but also areas that are related to that target. Prior to starting the game trainees are given information describing a situation and the rules for playing the game. They are then asked to play the game, usually being asked to make decisions about what to do given certain information. The trainees are then provided with feedback about the results of their decisions, and asked to make another decision. This process continues until some predefined state of the organization exists or a specified number of trials have been completed. For example, if the focus is on the financial state of a company, the game might end when the company has reached a specified profitability level or when the company must declare bankruptcy. Business games involve an element of competition, either against other players or against the game itself. In using them, the trainer must be careful to ensure that the learning points are the focus, rather than the competition. The in-basket technique simulates the type of decisions that would typically be handled in a particular position such as a sales manager or operations manager. It affords an opportunity to assess and/or develop decision-making skills and attitudes. To begin the exercise, trainees are given a description of their role (a current or future job) and general information about the situation. Trainees are then given a packet of materials (such as requests, complaints, memos, messages, and reports) which make up the in-basket. They are asked to respond to the materials within a particular time period (usually 2 to 4 hours). When the in-basket is completed, the trainer asks the trainee to identify the processes used in responding to the information and to discuss their appropriateness. The trainer provides feedback, reinforcing appropriate decisions and processes or asking the trainee to develop alternatives. A variation is to have trainees discuss their processes in a group format moderated by the trainer. Here the trainer should attempt to get the trainees to discover what worked well, what didn't and why. Case studies are most often used to simulate strategic decision-making situations, rather than the day-to-day decisions that occur in the in-basket. The trainee is first presented with a history of the situation in which a real or imaginary organization finds itself. The key elements and problems, as perceived by the organization's key decision makers, may also be provided. Case studies range from a few pages in length to more than a hundred. Trainees are asked to respond to a set of questions or objectives. Responses are typically, though not always, in written form. Longer cases require extensive analysis and assessment of the information for its relevance to the decisions being made. Some require the trainee to gather information beyond what was in the case. Once individuals have arrived at their solutions, they discuss the diagnoses and solutions that have been generated in small groups, large groups, or both. In large groups a trainer should facilitate and direct the discussion. The trainer must guide the trainees in examining the possible alternatives and consequences without actually stating what they are. Written and oral responses to the case are evaluated by the trainer. The trainer should convey that there is no single right or wrong solution to the case, but many possible solutions depending on the assumptions and interpretations made by the trainees. The value of the case approach is the trainees' application of known concepts and principles and the discovery of new ones. The solutions are not as important as the appropriateness with which principles are applied and the logic with which solutions are developed. The role play is a simulation of a single event or situation. Trainees who are actors in the role play are provided with a general description of the situation, a description of their roles (e.g., their objectives, emotions, and concerns) and the problem they face. Role plays differ in the amount of structure they provide to the actors. A structured role play provides trainees with a great deal of detail about the situation that has brought the characters together. It also provides in greater detail each character's attitudes, needs, opinions, and so on. Structured role plays may even provide a scripted dialog between the characters. This type of role play is used primarily to develop and practice interpersonal skills such as communication, conflict resolution, and group decision making. Spontaneous role plays are loosely constructed scenarios in which one trainee plays herself while others play people that the trainee has interacted with in the past (or will in the future). The objective of this type of role play is to develop insight into one's own behavior and its impact on others. How much structure is appropriate in the scenario will depend on the learning objectives. Whether structured or spontaneous, role plays may also differ based on the number of trainees involved. Single, multiple, and role-rotation formats provide for more or less participation in the role play. In a single role play, one group of trainees role plays while the rest of the trainees observe. While observing, other trainees analyze the interactions and identify learning points. This provides a single focus for trainees and allows for feedback from the trainer. This approach may cause the role players to be embarrassed at being the center of attention, leading to failure to play the roles in an appropriate manner. It also has the drawback of not permitting the role players to observe others perform the roles. Having non-trainees act out the role play may eliminate these problems, but adds some cost to the training. In a multiple role play, all trainees are formed into groups. Each group acts out the scenario simultaneously. At the conclusion, each group analyzes what happened and identifies learning points. The groups may then report a summary of their learning to the other groups, followed by a general discussion. This allows greater learning as each group will have played the roles somewhat differently. Multiple role plays allow everyone to experience the role play in a short amount of time, but may reduce the quality of feedback. The trainer will not be able to observe all groups at once, and trainees are usually reluctant to provide constructive feedback to their peers. In addition, trainees may not have the experience or expertise to provide effective feedback. To overcome this problem, video tapes of the role plays can be used by the trainee and/or trainer for evaluation. The role-rotation method begins as either a single or multiple role play. However, when the trainees have interacted for a period of time, the role play is stopped. Observers then discuss what has happened so far and what can be learned from it. After the discussion, the role play resumes with different trainees picking up the roles from some, or all, of the characters. Role rotation demonstrates the variety of ways the issues in the role play may be handled. Trainees who are observers are more active than in the single role play since they have already participated or know they soon will be participating. A drawback is that the progress of the role play is frequently interrupted, creating additional artificiality. Again, trainees may be inhibited from publicly critiquing the behavior of their fellow trainees. Behavior modeling differs from role plays and games by providing the trainee with an example of what the desired behavior looks like prior to attempting the behavior. While this method is primarily behavioral, steps 2 and 3 reflect the cognitively oriented learning features of the technique. Feedback to the trainee is especially powerful when video is used to record both the model's and the trainee's performance. Through split screen devices, the performance of the model and the trainee can be shown side by side. This allows the trainee to clearly see where improvements are needed. Mechanical, machine operation, and tool-usage skills are best learned through use of equipment simulators. Business decision-making skills (both day to day and strategic), planning, and complex problem solving can be effectively learned through the use of business games. The in-basket technique is best suited to development of strategic knowledge used in making day-to-day decisions. Case studies are most appropriate for developing analytic skills, higher-level principles, and complex problem-solving strategies. Because trainees do not actually implement their decision/solution, its focus is more on what to do (strategic knowledge) than on how to get it done (skills). Role plays provide a good vehicle for developing interpersonal skills and personal insight, allowing trainees to practice interacting with others and receiving feedback. They are an especially effective technique for creating attitude change, allowing trainees to experience their feelings about their behavior and others' reactions to it. The most common method of training, on-the-job training (OJT) uses more experienced and skilled employees to train less skilled and experienced employees. OJT takes many forms and can be supplemented with classroom training. Included within OJT are the job-instruction technique, apprenticeships, coaching, and mentoring. Formal OJT programs are typically conducted by employees who can effectively use one-on-one instructional techniques and who have superior technical knowledge and skills. Since conducting one-on-one training is not a skill most people develop on their own, train-the-trainer training is required for OJT trainers. In addition to training the trainers, formal OJT programs should carefully develop a sequence of learning events for trainees. The formalized instructional process that is most commonly used is called the job-instruction technique. The JIT was developed during World War II and is still one of the best techniques for implementation of OJT nearly forty years later. It focuses on skill development, although there are usually some factual and procedural-knowledge objectives as well. There are four steps in the JIT process: prepare, present, try out and follow up. Prepare. Preparation and follow up are the two areas that are most often ignored in OJT programs. Preparation should include a written breakdown of the job. Ignoring this step will prevent the trainer from seeing the job through the eyes of the trainee. When the trainer is very skilled there are many things he does on the job without thinking about them. This can result in their being overlooked in training without a systematic analysis and documentation of the job tasks prior to beginning training. Once the tasks have been documented, the trainer must prepare an instructional plan. Here, the trainer must determine what the trainee currently knows and does not know. This is the needs analysis phase of Figure 1. Interviewing the trainee, checking personnel records and previous training completed are among the many ways of determining what KSAs the trainee currently has. This is compared to the KSAs the trainee needs to perform the tasks. The instructional plan is then completed focusing on the trainee's KSA deficiencies. Immediately prior to the training, the trainee should be provided with an orientation to the OJT/JIT learning process. The orientation should help trainees understand their role and the role of the trainer. The importance of listening effectively and feeling comfortable asking questions should be emphasized. The trainee should become familiar with the steps in the JIT process so he or she knows what to expect and when it will occur. Present. In this stage of JIT there are four activities: tell, show, demonstrate, and explain. When telling and showing, the trainer provides an overview of the job while showing the trainee the different aspects of it. The trainer is not actually doing the job, but pointing out important items such as where levers are located, where materials are stored, and so on. The trainer then demonstrates how to do the job, explaining why it is done that particular way and emphasizing key learning points and important safety instructions. The components of the job should be covered one at a time, and in the order they would normally occur while performing the job. Try Out. The trainee should be able to explain to the trainer how to do the job prior to actually trying to do the job. This provides a safe transition from watching and listening to doing. When the trainee first tries out the job the trainer should consider any errors to be a function of the training, not the trainee's learning ability. When errors are made they should be used to allow the trainee to learn what not to do and why. The trainer can facilitate this by questioning the trainee about his actions and guiding him or her in identifying the correct procedures. Follow Up. During follow up the trainer should check the trainees' work often enough to prevent incorrect or bad work habits from developing. The trainer should also reassure the trainee that it is important to ask for help during these initial solo efforts. As trainees demonstrate proficiency in the job, progress checks can taper off until eventually they are eliminated. Apprenticeship training dates back to the Middle Ages, when skilled craftsmen passed on their knowledge to others as a way of preserving the guilds. Today, apprenticeship programs are partnerships between labor unions, employers, schools, and the government. They are most often found in the skilled trades and professional unions such as boiler engineers, electrical workers, pipe fitters, and carpenters. The typical apprenticeship program requires two years of on-the-job experience and about 180 hours of classroom instruction, though requirements vary. An apprentice must be able to demonstrate mastery of all required skills and knowledge before being allowed to graduate to journeyman status. This is documented through testing and certification processes. Journeymen provide the on-the-job training, while adult education centers and community colleges typically provide the classroom training. Formal apprenticeship programs are regulated by governmental agencies that also set standards and provide services. Coaching is a process of providing one-on-one guidance and instruction to improve the work performance of the person being coached in a specific area. It differs from other OJT methods in that the trainee already has been working at the job for some time. Usually, coaching is directed at employees with performance deficiencies, but it can also serve as a motivational tool for those performing adequately. Typically the supervisor acts as the coach. Like the OJT trainer, the coach must be skilled both in how to perform the task(s) and how to train others to do them. The amount of time supervisors devote to coaching activities steadily increased during the 1990s and will likely represent more than 50 percent of supervisors' time by the new millennium. The coaching process, viewed from the coach's perspective, generally follows the outline below. Note the similarities between JIT and this process. Understand the trainee's job, the KSAs and resources required to meet performance expectations, and the trainee's current level of performance. Meet with the trainee and mutually agree on the performance objectives to be achieved. Mutually arrive at a plan/schedule for achieving the performance objectives. At the work site, show the trainee how to achieve the objectives, observe the trainee's performance, then provide feedback. Repeat step 4 until performance improves. pararing is a form of coaching in which an ongoing relationship is developed between a senior and junior employee. This technique focuses on providing the junior employee with political guidance and a clear understanding of how the organization goes about its business. Mentoring is more concerned with improving the employee's fit within the organization than improving technical aspects of performance, thus differentiating it from coaching. Generally, though not always, mentors are only provided for management-level employees. Beer, Valorie. The Web Learning Fieldbook: Using the World Wide Web to Build Workplace Learning Environments. San Francisco, CA: Jossey-Bass/Pfeiffer, 2000. Blanchard, P.N., and J.W. Thacker. Effective Training: Systems, Strategies, and Practices. 2nd ed. Englewood Cliffs, NJ: Prentice Hall, 2003. Decker, P., and B. Nathan. Behavior Modeling Training: Principles and Applications. New York: Praeger, 1985. Gold, L. "Job Instruction: Four Steps to Success." Training and Development Journal, September 1981, 28–32. Goldstein, Irwin L., and Kevin J. Ford. Training in Organizations. 4th ed. Belmont, CA: Wadsworth Group, 2002. Noe, R.A. Employee Training and Development. Boston: Irwin McGraw-Hill, 1999. Rothwell, William J., and H.C. Kazanas. Improving On the Job Training. 2nd edition. San Francisco: Jossey-Bass, 2004. Welsh, Elizabeth, Connie Wanberg, Kenneth G. Brown, and Marcia J. Simmering. "E-Learning: Emerging Uses, Empirical Results, and Future Directions." International Journal of Training and Development 7, no. 4 (2003): 245–258. Thanks, this article was well produced and delivered. It's an excellent reference.It made me aware of some methods that i missed to use. Coaching is a process of providing one-on-one guidance and instruction to improve the work performance of the person being coached in a specific area.Business games attempt to reflect the way an industry, company, or functional area operates. They also reflect a set of relationships, rules, and principles derived from appropriate theory (e.g., economics, organizational behavior, etc.). Many business games represent the total organization, but some focus on the functional responsibilities of particular positions within an organization (e.g., marketing director, human resource manager). These are called functional simulations. Games that simulate entire companies or industries provide a far better understanding of the big picture.